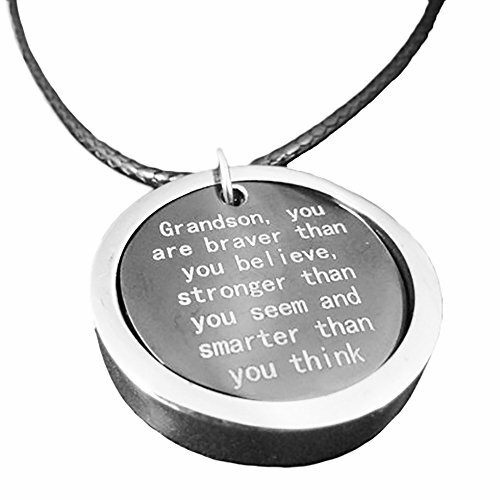 Show and help build your grandson’s faith in himself with the ‘Grandson, you are braver than you believe, stronger than you seem and smarter than you think’, necklace. It will remind him that you see his potential and love him unconditionally, while giving him strength. Order today to show your little angel that you think they’re perfect. The 16.5″ chain with a 2″ extender chain will nicely fit all ages. The necklace is made of strong stainless steel that is extremely durable and will not rust or tarnish. Packaged in a beautiful velvet jewelry bag. It ships the same day so you will receive your necklace with lightning speed!Beautiful message to give to your grandson to lift him up. The perfect gift from grandmother to her grandson. Remind them of how special they are to you. Outside sliver ring moves independently of inner dark pendant. Elegant and durable stainless steel pendant with message. 16.5″ Chain length plus the 2″ extender will provide the perfect fit for all.